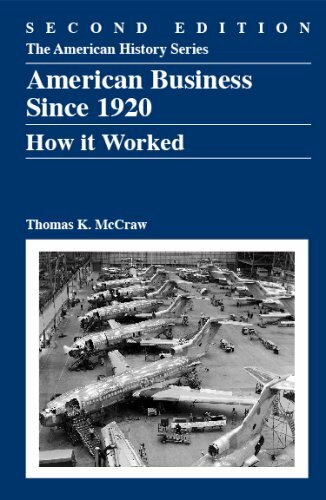 It's safe to say that since the first appearance of Thomas McCraw's contribution to Harlan Davidson's American History Series in 2000, American business has taken some of the most dramatic, perhaps most incredible, turns in its history. Far more than an update, the second edition of one of our most popular texts has been carefully revised and reorganized—not only to include necessary new coverage but to present more fully and forcefully the book's central argument and major themes, making this new edition even more "teachable" for instructors and accessible to student readers. Unique in the market for its breadth of coverage and depth of analysis, the new edition of our uncommonly readable book by Pulitzer Prize-winning author Thomas K. McCraw will continue as a classic supplementary text in a variety of undergraduate as well as graduate courses and seminars. Featuring three banks of striking photographs and a completely up-to-date bibliographic essay, this compact, enjoyable work will be highly appreciated by all students of U.S. business history and the art of administration. Thomas K. McCraw is the Straus Professor of Business History Emeritus at Harvard Business School. Among the many books he has written or co-authored are Prophet of Innovation: Joseph Schumpeter and Creative Destruction, which in 2008 was awarded the Hagley Prize for Business History, the Spengler Prize in the History of Economics and the biennial award given by the International Schumpeter Society; Creating Modern capitalism: How Entrepeneurs, Companies, and Countries Triumphed in Three Industrial Revolutions (1997); Management Past and Present: A Casebook in American Business History (1996); American Versus Japan: A Comparative Study of Business-Government Relations (1986), and Prophets of Regulation, which won the Pulitzer Prize in History in 1985 and the triennial Thomas Newcomen Book Award in 1986. He has served as editor of the Business History Review, as associate editor of The Encyclopedia of the United States in the Twentieth Century, and as president and trustee of the Business History Conference. He has been a member of the Board of Syndics of Harvard University Press, the Council of the Massachusetts Historical Society, the advisory board of Nomura School of Advanced Management (Tokyo), and the editorial boards of Reviews in American History and Harvard Business Review.